Stampin' Ribbons: Our home is being sided today, on the craft room side of our home...nothing but noise, which prohibits me from filming. I have an added project, which added to the vintage look of this card...I can't wait to show you it. I'm saving my haul off to the side, so we can enjoy it together...smiles...this is the embedded card from last week. I found this pretty little box its sitting on at our local thrift store on Tuesday of last week. See you soon! Our home is being sided today, on the craft room side of our home...nothing but noise, which prohibits me from filming. 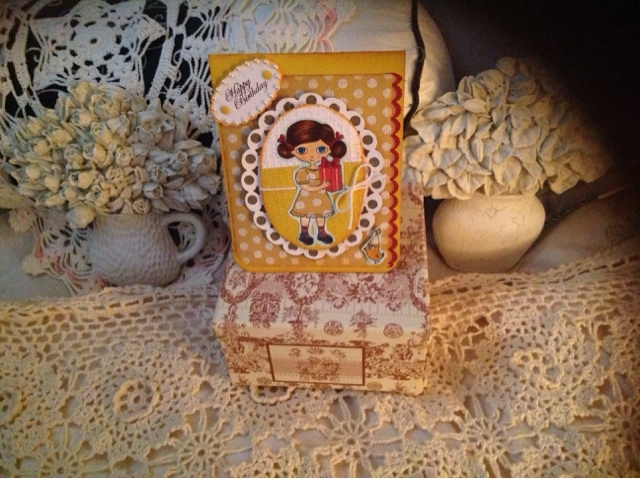 I have an added project, which added to the vintage look of this card...I can't wait to show you it. I'm saving my haul off to the side, so we can enjoy it together...smiles...this is the embedded card from last week. I found this pretty little box its sitting on at our local thrift store on Tuesday of last week. See you soon!